How to Get Cheapest Car Hire Bristol Airport ? When you arrive at Bristol Airport (BRS), it's nice to know that you have a choice of rental car agencies waiting to provide you with the best cars and a selection of cheap car hire Bristol Airport deals available, to make life easier for you. Why Do Car Hire Compare Bristol Airport ? Like all good travel sites, when you compare car hire Bristol airport with Best Car Hire we will find you a selection of cheap car hire Bristol Airport offers, and by comparison will save you money. By pre-booking online, the best Bristol airport car rentals, your preferred vehicle will be ready and waiting for you. This allows you more time to hit the road and commence your important business itineray or travel to your luxury holiday destination in England or near-by Wales..
Be it a short term or a long term rental, avoid over-the-top fees and choose from a selection of the best Bristol Airport car rentals including people carrier, SUV, economy, executive, saloon or hatchback vehicles at the cheapest price that suits your budget. Where is Bristol Airport ? Bristol Airport (IATA airport code - BRS) is located southwest of Bristol city centre at Lulsgate Bottom, in North Somerset, and is the UK's 9th busiest airport. Which Car Hire Companies are Based in Bristol Airport ? We compare car hire Bristol Airport prices to provide a selection of the the big brands car hire companies to rent a car from including Alamo, Avis, Budget, Easirent, Enterprise, Europcar, Firefly, Green Motion, Hertz, Keddy by Europcar, National and Sixt. All the car hire companies are within easy walking distance of Bristol Airport terminal, or take the local public transport connections for additional downtown Bristol locations. Which Types of Car Can I Hire at Bristol Airport ? Rent a car in Bristol Airport from a selection of economy-sized, larger car or luxury car rental deals, with or without air conditioning, automatic or manual transmission and with limited or unlimited mileage. These Bristol Airport rental cars include the smaller (Fiat 500, Hyundai i10), the economy (Opel Corsa, Volkswagen Polo, Ford Fiesta, Citroen C3, Audi A1),the compact (Ford Focus, Volkswagen Golf, Fiat 500L, Opel Astra, Peugot 308, Seat Leon, Fiat Tipo, Renault Captur, Opel Crossland X, BMW 1 Series, Kia Ceed, Mercedes A Class, Seat Leon), the estate cars (Volkswagen Golf Estate, Opel Astra Estate, Skoda Octavia Estate, Volkswagen Passat Estate, Opel Insignia Estate, Ford Mondeo Estate, Skoda Superb Estate, Kia Ceed Estate, Audi A4 Estate, Volvo V60 Estate and the Mercedes C Class Estate 4Matic), the standard cars (Opel Insignia, Skoda Superb, Volkswagen Passat and the Ford Mondeo), the intermediate cars (Volkswagen Jetta, Skoda Octavia, Opel Insignia, Peugot 3008, and the Volvo V40). All Bristol Airport hire car deals are subject to availability. Can I Arrange a Minivan or People Carrier Hire Bristol Airport? A People Carrier is the best economical choice of vehicles for all those occasions where you need to transport the family around or multiple groups of people such as weddings, children’s parties, hen parties, stag parties or sporting events. If you are arriving at Bristol Airport and your group of friends want to hire a people carrier or a minivan to see a big football or rugby match, or have a fun golf outing somewhere in England or Wales, we recommend that you pre-book online, the best MPV on offer, at least two months in advance. As such, you will find that car hire Bristol Airport will be easier and you will get cheaper people-carrier rental rates. The summer time, Christmas and Easter holidays are our busiest times for MPV or people carrier at Bristol Airport bookings, so it is best to plan your car hire accordingly. We find that holidaymakers benefit from a people carrier hire Bristol Airport especially when they need a larger car rental for 6-seater, 7-seater, 8-seater or even 9-seater - oh and did we mention? - people-carriers can be fun to drive! Included within the best Bristol airport car rentals we can offer minivan or people carrier hire Bristol Airport, including, 5-seater (Citroen C4 Picasso or BMW 2 Series Active Tourer), 7-seater (Opel Zafira, Citroen C4 Grand Picasso, Volkswagen Sharan, Ford Galaxy, Volkswagen Touran, Seat Alhambra, Volkswagen Caddy or the Mercedes Vito), or the 9-seater (Ford Transit and the Ford Tourneo). If you are looking for a selection of luxury car hire Bristol Airport offers you can choose from the following makes and models :- Mercedes C Class, Mercedes E Class, BMW 5 Series, Nissan Qashqai, Renault Kadjar, Toyota Rav4, Kia Sorento, Volvo XC60, Nissan Pathfinder, Range Rover Evoque, Jeep Grand Cherokee, Range Rover and the Land Rover Discovery. If you are looking for van hire Bristol Airport, perhaps because you are moving to a new home, maybe you have some large furniture which needs to be transported from A to B, maybe you need a replacement van while your business transport is off the road, or perhaps you play in a band and need a van to transport all your musical equipment to your next gig or concert – we can find a van to suit your purpose. Just remember that with any car hire deals, the suggested cheap car hire may not be the cheapest car hire Bristol Airport, so please take this into consideration when you consider any car rental discounts and book the reservation. If you are travelling from Bristol Airport please take advantage of our car parking offers. Bristol is a world class tourist destination with many sights to see in Bristol city centre and the surrounding English countryside. The fifth oldest zoo in the world can be found at Bristol Zoo Gardens. 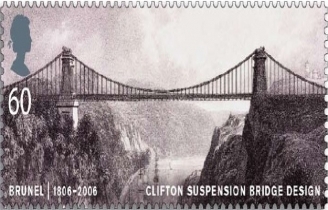 The Clifton Suspension Bridge, built by Brunel, spans the glorious Avon Gorge, on the River Avon. The beautiful city of Bath, Somerset, is within easy reach of Bristol. Visit Bath to see many Roman buildings, monuments , bath-houses and spa's. Take the kids to Longleat Safari Park, Cheddar Gorge and Wookey Hall caves or take the M5 motorway to Cornwall and Devon for some marvellous coastlines and scenery..
All distances and travel times are subject to traffic conditions at time of travel. Bristol Airport is one of the busiest airports in the UK by total passenger traffic. Click here for details of Bristol Airport flight arrivals, departures and delays. What Documentation Do I Require for my Bristol Car Hire ? To help you rent a car in Bristol Airport, we have prepared a car hire travel checklist to help you with your cheap car hire Bristol Airport reservation, but to avoid a headache if you don't plan properly, you will require a valid credit card, a valid photo ID (passport or national ID), driver's licence valid for 2 years and a printed version of the car rental voucher. If you do not present any of the documents mentioned, the documentation is not valid or you do not have enough funds on your credit card, the car rental agent may refuse to release the vehicle and no pre-paid funds will be reimbursed to you. If you are using a Sat Nav to calculate the GPS, the Bristol Airport postcode is BS48 3DY. For Silver Zone please follow directions as you approach the airport on the A38. From North M5 - Leave the M5 motorway at junction 18 (signposted A4 Bristol & Airport). Take the A4 towards Bristol following signs for the Airport (signposted A4 and A370 Bristol & Airport). From South M5 - Leave the M5 motorway at Junction 22, at roundabout take 3rd exit signposted A38 road. At East Brent roundabout joining the A370 take 2nd exit signposted A38 & Airport. Continue on this road for approx 11 miles, Airport is on the left. From East M4 - At Junction 20, join the M5 motorway southbound. Exit the M5 at junction 18 (signposted A4 Bristol & Airport). Take the A4 towards Bristol following signs for the Airport (signposted A4 and A370 Bristol & Airport). From South East (Bath) - Follow the A4 towards Bristol, bear left onto the A4174 signposted Ring Road. Continue to follow signs for Airport and A38 Taunton. From South Wales - Follow M4 motorway over the second Severn Crossing. At junction 22 branch left to join M49 motorway (signposted South West). Take the A4 (signposted A4 and A370 Bristol & Airport). Can You Help Me With Motorhome Hire Bristol Airport ? If you are looking for a motorhome rental Bristol Airport then our sister website Holiday Campervan would be happy to help with a range of motorhome and campervan hire deals at Bristol Airport. When looking for Cheap Car Hire Bristol Airport it's easy with our PC, tablet or smart phone apps. Our multi-lingual team of customer care agents are on hand 24 hours a day, 7 days a week to assist if you should require assistance with your cheap car hire Bristol Airport..
With a great range of shops, restaurants, bars and cafes, there is something for everyone in the departure lounge at Bristol Airport. It is recommended that you arrive at least 2 hours before the scheduled time of your departure to ensure there is enough time to get through the check in and security processes. Once through security, why not browse the extensive World Duty Free store, pick up some last minute essentials from Superdrug, buy a newspaper and book from WHSmith or relax in one of the catering facilities on the upper level. Stores will normally be open between the hours of our first and last departing flight each day. The Express Drop Off & Pick Up area is the fastest and most convenient way to drop off or collect passengers. A minimum charge of £1 applies in this car park, for a stay of up to 20 minutes. 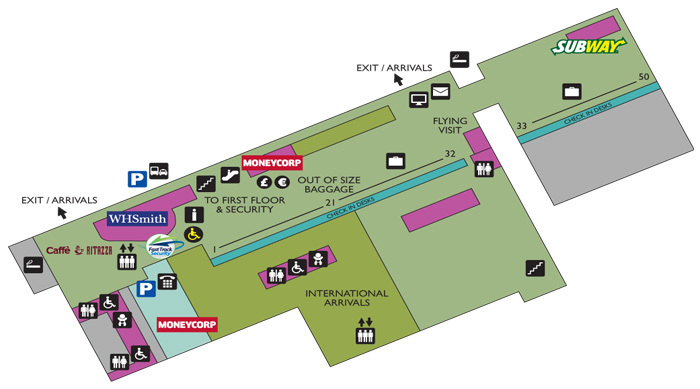 The Terminal is easily accessible from this car park via a covered walkway, and flight information displays are located in this area to assist those arriving for flights or waiting to pick up returning passengers. The car park uses the latest in automatic number plate recognition (ANPR) ticketless technology. Cameras will read your vehicle registration on entry, with payment taken at exit in coin-bins or via credit/debit card. There will be no surcharge for using a credit card in this car park.